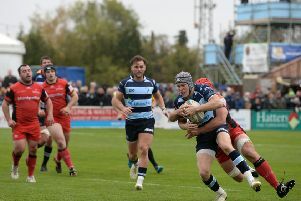 Bedford second rower Will Carrick-Smith is aware another big performance is needed if his side want to continue their unbeaten British & Irish Cup campaign at Yorkshire Carnegie on Saturday. The Blues head to Headingley Stadium after beating Newport Gwent Dragons Premiership Select 46-33 at the weekend, while Carnegie were losing 51-35 at Ealing Trailfinders. Speaking to the club’s official website, Carrick-Smith said: “We know that we’ve got work to do heading into the game against Yorkshire Carnegie. Meanwhile, Carrick-Smith was happy with parts of the performance at Goldington Road on Saturday, but knows his side could do better. He added: “It was tough all round for us out there. “We had the slope against us in the first half and while a few things were going right for us, there were a few things that were also going wrong as well. “We’ll take a look at them and then address it next week. “From a forwards point of view, the lineout functioned really well with the first job being done really well but looking after the ball when we came down was a bit of an issue.